U.S. President George W. Bush, scrambling to show he still backs embattled Iraqi Prime Minister Nouri al-Maliki, offered him a fresh endorsement, calling him "a good guy, good man with a difficult job." "I support him," Bush said Wednesday, a day after he acknowledged frustration with the Iraqi leader's inability to bridge political divisions in his country. "It's not up to the politicians in Washington, D.C., to say whether he will remain in his position. It is up to the Iraqi people who now live in a democracy and not a dictatorship." Bush's validation of al-Maliki, inserted at the last minute into his speech to the Veterans of Foreign Wars convention on Wednesday, stole the spotlight from Bush's attempt to buttress support for the war by likening today's fight against extremism to past conflicts in Japan, Korea and Vietnam. 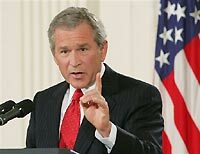 Bush's speech - and another one like it next Tuesday - are intended to set the stage for a crucial report next month on the progress of the fighting and steps toward political reconciliation in Iraq. Democrats in the U.S. Congress and some Republicans are pressing to start the withdrawal of U.S. forces. On Thursday, U.S. intelligence agencies will issue a new assessment expressing doubt that al-Maliki's government can overcome sectarian divisions or meet benchmarks toward achieving political unity, The New York Times reported on its Web site Wednesday night. The report cited unidentified officials. Bush had appeared on Tuesday to be distancing himself from the Iraqi leader when he said at a North American summit in Canada: "Clearly, the Iraqi government's got to do more." The White House denied Bush was backing away from al-Maliki, but it was lukewarm validation compared with Bush calling al-Maliki "the right guy for Iraq" last November in Jordan.